Baker, D. F., R. M. Law, K. R. Gurney, P. Rayner, P. Peylin, A. S. Denning, P. Bousquet, L. Bruhwiler, Y. -H. Chen, P. Ciais, I. Y. Fung, M. Heimann, J, John, T. Maki, S. Maksyutov, K. Masarie, M. Prather, B. Pak, S. Taguchi, and Z. Zhu, 2006: TransCom 3 inversion intercomparison: Impact of transport model errors on the interannual variability of regional CO2 fluxes, 1988-2003. Global Biogeochemical Cycles, 20, GB1002, doi:10.1029/2004GB002439. Maki, T, T. Koide, T. Sasaki, and TransCom 3 modelers, 2001: Sensitivity of Japan Meteorological Agency Carbon Dioxide Transport Model to Carbon Dioxide Monitoring Network. Extended abstracts 6th International CO2 conference, Sendai, Japan, Oct. 2001, 835-838. Maksyutov, S., T. Machida, H. Mukai, P. Patra, T. Nakazawa, G. Inoue, and Transcom-3 modelers, 2004: Effect of recent observations on Asian CO2 flux estimates by transport model inversions, Tellus, 55B, 522-529. Onogi, J. K., Tsutsui, H. Koide, M. Sakamoto, S. Kobayashi, H. Hatsushika, T. Matsumoto, N. Yamazaki, H. Kamahori, K. Takahashi, S. Kadokura, K. Wada, K. Kato, R. Oyama, T. Ose, N. Mannoji, and R. Taira, 2007: The JRA-25 Reanalysis. Journal of the Meteorological Society of Japan, 85, No. 3, 369-432. Patra, P. K., and S. Maksyutov, 2002: Incremental approarch tothe optimal network design for CO2 surface source inversion. Gephys. Res. Lett., 29, 10, doi:1029/2001GL013943. Patra, P., S. Maksyutov, and Transcom-3 modellers, 2004: Sensitivity of optimal extension of CO2 observation networks to model transport. Tellus, 55B, 498-511. Patra, P. K., S. L. Maksyutov, and T. Nakazawa, 2005: Analysis of atmospheric CO2 growth rates at Mauna Loa using CO2 fluxes derived from an inverse model. Tellus B 57 (5), 357-365. 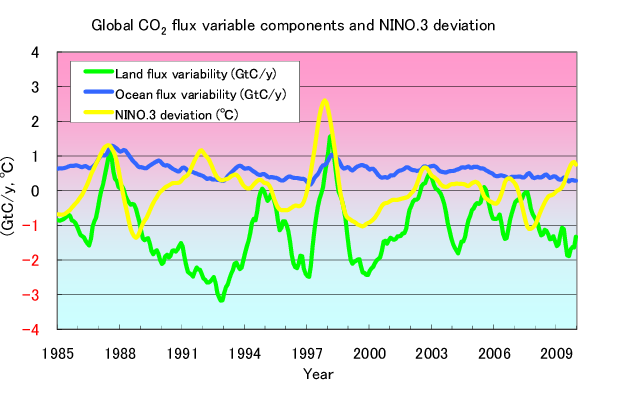 Rödenbeck, C., S. Houweling, M. Gloor, and M. Heimann, 2004: CO2 flux history 1982-2001 inferred from atmospheric data using a global inversion of atmospheric transport. Atmospheric Chemistry and Physics, 3, 1919-1964. Rödenbeck, C., T. J. Conway, R. L. Langenfelds, 2006: The effect of systematic measurement errors on atmospheric CO2 inversions: a quantitative assessment. Atmospheric Chemistry and Physics, 6, 149-161. Sasaki, T., T. Maki, S. Oohashi and K. Akagi, 2004: Optimal sampling network and availability of data acquired at inland sites. Global Atmosphere Watch Report, No. 148, 77-79. Suntharalingam, P., C. M. Spivakovsky, J. A. Logan, and M. B. McElroy, 2004: Estimating the distribution of terrestrial CO2 sources and sinks from atmospheric measurements: Sensitivity to configuration of the observation network. J. Geophys. Res., 108(D15), 4452, doi:10.1029/2002JD002207.